Jair Bolsonaro's proposed pension reform would affect poor and informal workers, older adults, people with disabilities, while not solving the budget deficit problem, experts say. The constitutional amendment proposal of the Brazilian far-right government’s economic team brings back measures from ex-president Michel Temer’s original proposal, such as raising the retirement age for women to equalize it to men at 65. The government also wants to establish that workers must pay social security contributions for at least 40 years to be able to receive full retirement benefits. But what’s really new about the government’s draft bill, publicized by news portals Estadão and Broadcast agency, is the creation of a capitalization system. In this proposed system, the public pension fund would be eliminated and contributions would then be made to each worker’s own capitalization account. The worker's pension would therefore depend on the yield. Currently, Brazil has a pay-as-you-go system, in which workers, employers, and the government all pitch in, so the public pension fund grows as employment grows. The Bolsonaro administration estimates that the transition between the current and the new pension systems would take 19 years. 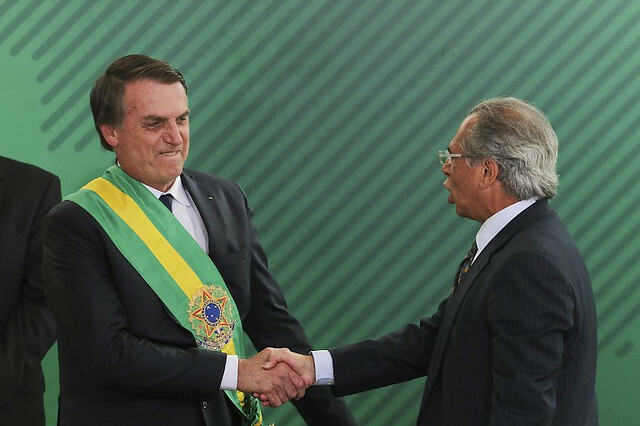 Denise Gentil, an economist and professor at the Federal University of Rio de Janeiro, says that, if the Congress passes the bill as it is, Bolsonaro’s reform will increase inequality in the country. She argues that the social cost of this change is that not all workers will be able to save part of their earnings for when they eventually can’t work anymore. “With the low wages we have today in Brazil, very few Brazilians will be able to retire in the future. And the State decided to forsake this part of the population, because the pay-as-you-go system is basically gone,” she said. Four in ten people in Brazil are informal workers, according to the Brazilian Institute of Geography and Statistics. The country lost 460,000 formal jobs in 2017 and 2018. The government’s draft, at this point, proposes only capitalization as the mandatory system, for later regulation. The lawyer and former Social Security minister Carlos Eduardo Gabas says that the system proposed by the Bolsonaro administration, which is inspired by Chile’s 1980s pension system, will be “a disaster” for the country. While the president argued in a statement to the Congress this week that his far-right administration’s proposal is “modern and fraternal, bringing together actuarial balance and support to those who need it the most,” the draft bill – a top priority for the government right now – could directly impact the lives of 4.6 million low-income older adults and people with disability. The government wants to decouple the minimum wage from a pension older people and people with disability who don’t have a source of income and can’t be supported by their families receive. That means recipients – current and new – would earn less than a minimum wage. But what the government does not show with the proposal is that this benefit, paid to 2 million older adults and 2.6 million people with disabilities, represents only 3 and 3.9 percent, respectively, of the country’s total social security spending. Meanwhile, those demographics are only 13.2 percent of all public pension recipients.